Cacti and succulents are trendier than ever! Besides making for super cool houseplants (not to mention, easy to care for), these DIY ideas are all inspired by the prickly plant. Check out all the ways you can incorporate cactus decor into your home, without having to tend to the actual plant! If you're looking for a cool way to display and organize your jewelry, this is it! This easy clay project comes together rather quickly (30 minutes in the oven and voila!) and the unique little sculpture will surely grab the attention of all your friends and family. Add a grouping of some vivid cacti or succulent art to one of the walls in your home by printing black and white plant photographs which can be transferred to a wood board or canvas using mat medium for some spectacular art as done by Persia Lou. Head off shopping or to the beach using this chic DIY gold cactus summer tote which is made by ironing on a piece of gold vinyl cut into the shape of a cactus. In only a few minutes this simple DIY designed by Lovely Indeed is the perfect way to carry all your summer essentials. While a cactus is not typically something you would consider snuggling this DIY cactus pillow by Everything Emily makes for a great toss pillow for your living room with an easy to sew original design complete with soft yarn thorns. This weekend make your own amazing cactus stool that also works as an ottoman for your home that is a playful way to add additional seating to your home as done by Oh Oh Blog. Make everyone laugh at the next costume party you go to by dressing up as a cactus with this original idea by Studio DIY that is perfect for a last minute costume as all you need is a green tee dress and some white yarn for needles. Organize your jewelry by crafting your own lovely cactus ring holder that is perfect for your nightstand or vanity by attaching a mini plastic cactus to a small piece of wood as done by Vitamini Handmade to beautifully store your rings. While having patterned wallpaper walls is often a great way to transform the look of a room and inject personality into a space lining up strips of wallpaper can often be rather time consuming. A Beautiful Mess came up with a gold cactus themed DIY that uses a cactus stencil and gold leafing pens on the wall to stencil a wallpaper design that will give the same look as wallpaper without all the hassle of lining up rolls of wallpaper. Instead of using the standard gift wrap you can buy in stores, wrap the gift you are giving in your own amazing handmade cactus gift wrap with stamped design and fun decorative pom poms as crafted by The Proper. Update your sofa with a new cactus graphic pillow that you can make by carving your own cactus stamp out of craft foam and stamping your design all over a blank pillow cover just like Patchwork Cactus did to create a modern black and white toss cushion. 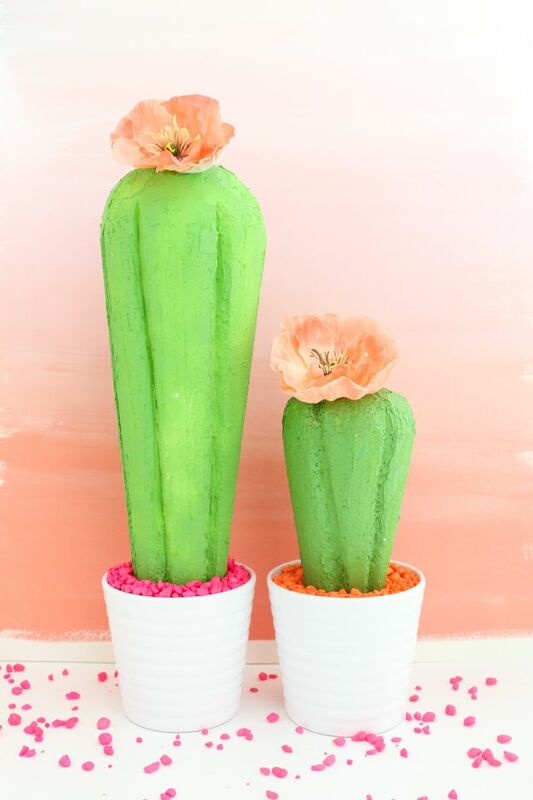 Enhance your cactus themed party with a spectacular large faux cactus centerpiece for your table as instead of using an actual cactus this faux cactus by A Kailo Chic Life made out of foam is safer for children as there are no needles for them to get hurt by. Transform cupcakes into adorable cacti with a printable mini cupcake template from Oh Happy Day which use green printed paper to raise a cupcake on a stand that looks like a cactus. For your next summer party make sure to serve these mini cacti cupcakes as they are sure to be a hit with your guests. Making your own neon sign for your home is much easier than you might expect. Unlike expensive neon signs sold in stores, Shrimp Salad Circus made a potted neon cactus with a bendable EL wire for under $5. Just like you might have done as kids, Say Yes demonstrates how to turn a regular potato into a carved cactus stamp that can be used to stamp a design onto a blank tea towel. This super easy DIY is perfect for novice DIYers and will result in some outstanding tea towels that you will want to display in your kitchen. Enhance your summer patio party by adding several DIY cactus balloons around your yard for some fun decor as done by Design Improvised. This clever DIY is affordable to make as you can use a package of green balloons and tie the inflated balloons together to make your own cacti. Whether you are renting or need a way to temporarily decorate your home for a party this DIY idea by Studio DIY is the perfect way to add art to your walls that is easy to remove as it is made with washi tape so it can be stuck on the walls and peeled off later without damaging the paint on the walls. Enhance your sewing kit by ditching your old bland pincushion for a cute felt cactus pincushion that is easy to sew and can be used to store all your sewing pins. Either make one potted cactus pincushion or a set of various shaped cactus pincushions as done by A Beautiful Mess and use your mini cactus not only for organizing your sewing supplies by decorative plants too! Inspired to host a cactus themed party? Complete your table setting for your cactus party theme by creating your own set of vividly hued reusable cactus place cards to show your guest where to sit at the dinner table as done by Oh Happy Day with air dry clay. Do you love to celebrate taco Tuesday each week? If so, then next Tuesday end your Mexican themed taco fiesta on a sweet note by serving a cake decorated with colorful cactus cake topper as done by Tell Love And Party which can be made out of sheets of craft foam. Get a large cactus for your home, that is children and pet-friendly by sewing your own large green felt cactus that is thorn-free and can be stuck into an empty plant pot as done by A Beautiful Mess. For a surprising twist, contrast your cactus sharp needles with soft pom poms which you can wrap around your household cactus plant for a playful way to add more color and personality to your home as demonstrated by Sugar And Cloth. Use PVC end caps found at hardware stores to make your own tiny plant pots just like Sugar and Cloth did to plant small cacti in. The mini planted cactus can be gathered together at the party to serve as decor for your summer fiesta, and once the party ends, guest can grab one of the cactus plants to bring home with them as a party favor. Update your morning routine by making your own your cactus mug just like Enthralling Gumption did by drawing mini cactus with a porcelain pen on a white mug to have a brand new cup to have your morning cup of coffee in. Are you loving everything cactus right now too? If so, try your hand at painting your own watercolor cactus painting by following the tutorial at Ink Struck who will show you how to easily paint your own watercolor cactus masterpiece to hang on your walls. Get craft and make a new catnip toy that your cat can play with around the house with a soft felt cactus catnip toy just like one of the different shaped of cactus toys Tattooed Martha made for her cat. Decorate for your next party by stringing up a few mini cactus pinatas which you can make just like Oh Happy Day out of toilet paper rolls and green tissue paper. Once completed the pinatas can be hung from the ceiling, and each guest can have their individual pinata that they can break to get the candy inside as fun party favor. Rock the cactus trend by sporting your own handmade flair cactus pin on your coat, shirt or bag by using the template from Damask Love ​to cut the design with your Cricut that can be glued onto a pin. Add a quirky cactus side table just like Plaster And Disaster, to your living room by using a large artificial cactus plant, paint, and wood to form a new piece of furniture for your home this weekend. Lack a green-thumb? This foil cactus plant is the perfect way to add a cactus to your home that will never die. Made out of green foil that is applied with a MINC foil applicator The Crafted Sparrow designed an easy to make and needle-free plant that looks amazing and will give you the look of having a plant without needing to care for one. Print these adorable cactus fiesta cupcake toppers designed by A Subtle Revelry to attach onto toothpicks and stick into the top of your cupcakes for an easy way to decorate your homemade cupcakes at your next celebration. Update your old bowls, like Sugar and Cloth did by painting a cactus pattern with porcelain paint on the interior of small bowls to create the perfect fun dip or snack bowl that is perfect for serving chips and salsa.